We could spend a lot of time listing the design and feature tweaks we want to see in the Samsung Galaxy Gear 2, but there's no getting around the fact that the biggest problem with the current watch is the price. So the latest rumour might be the most pleasing yet: according to "local industry officials" speaking to ZDNet Korea, Samsung is rethinking the watch's price point. 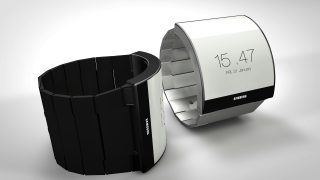 These sources say that Samsung's got the heebie jeebies about Apple's plans for an iWatch, which could be cheaper than the Gear 2. That's the same iWatch that may not even be real - for all we know right now, Tim Cook and his board are laughing into their coffees as the rest of the tech world frantically tries to preempt the arrival a non-existent device. Still, with Apple dropping various clues that it's planning something big in the fitness domain, Samsung is probably wise to plan ahead. The current Galaxy Gear launched with the eye-watering price of £299 or $299 (Around AU$324), which contributed to the less-than-glowing reception it received. The same sources also say that the Samsung Galaxy Gear 2 will make ifs official debut at MWC. It's not the first time we've heard that rumour. Samsung is unpacking the Galaxy S5 on February 24 and so far all reports suggest it will launch its new smartwatch at the same time. Ok, so if an iWatch does exist, what do we know about it so far?